When you think of Tenerife you imagine the sun, the ocean breeze, the lovely Canarian people… Not everyone matches the island with adventure and emotion. But you are on this website, which means you’re likely into that kind of holidays. Then, why don’t you try a paragliding tandem flight Los Cristianos? A paragliding experience is what your trip needs to become one of the most incredible trips of your life. Are you visiting Tenerife with friends or family? Great! Paragliding is for everyone, as long as you love nature and adrenaline as much as we do. The team of Overfly Tenerife is in love with the island’s skies and we would love you to join us in a paragliding tandem flight Los Cristianos. The things you get to see when the ground is more than two kilometers under your body are difficult to compare. Have you seen the paragliding options we offer? We are sure there is at least one that you would love trying. 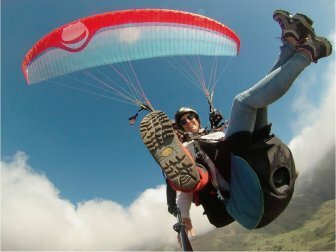 If you are considering the idea of paragliding in Tenerife, you are more than welcome to contact us. We will be waiting for your call! We are looking forward to sharing the gliding experience with you. 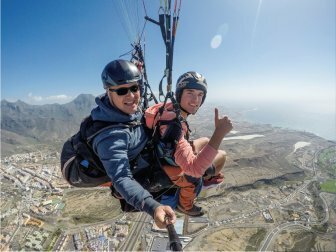 If you are excited to fly across the south of the island with us, book your paragliding trip in Los Cristianos! What is tandem paragliding about? Overfly Tenerife can help you to make your dream come true. 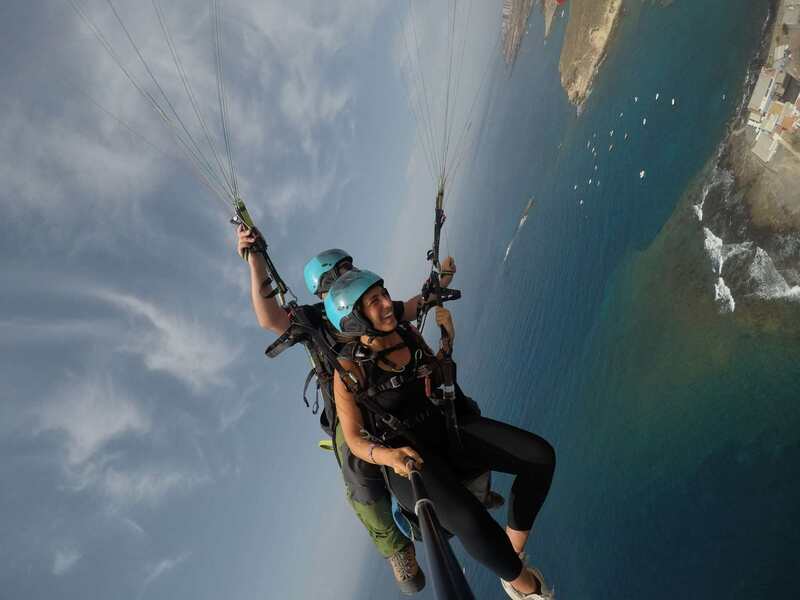 A paragliding tandem flight in Los Cristianos with us is the closest you can get to flying. Let us show you our perfect mix of adventure and sightseeing. Our advanced paragliders are prepared to take you 2.200 meters above the ground. We will give you the equipment required to fly: a paragliding helmet and a harness. Just bring comfortable clothes and your sunglasses! Do you like the idea of getting to know new places from the sky? We like it too! And we have done it many times. That’s why we can guarantee you that this island is the best place to start paragliding in this country. What are you going to see? Get the most amazing views of Teide National Park, Barranco del Infierno and Forest Crown. There’s nothing like this in any other location of Spain! Gliding consists of letting the wind help you fly across the sky. It makes you feel free like anything else in the world does. Our professional instructor will be in charge of taking you to the best places on the island. If you are an adrenaline lover, you shouldn’t come to the island and miss an experience like this. Flying above everything and everyone else will create a memory you won’t ever forget.